Following exhibitions at Mall Galleries, London and Trowbridge Arts in Wiltshire, the Derwent Art Prize 2018 has continued its UK-wide tour, opening on 15 November for a 2-month period at the Derwent Pencil Museum in Keswick, Cumbria until the 31st January 2019. 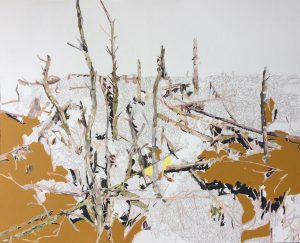 The exhibition features artwork by 20 artists from the North of England alongside the four individual Prize-winners: French artist France Bizot; Jovanka Stanojevic from Serbia; Royal Academy Schools alumnus Anna Gardiner; and Emma Bertin Sanabria who, like France Bizot, is an alumnus of L’École nationale supérieure des Arts Décoratifs in Paris. Artist and scholar Patricia Cain will be showing her large scale mixed media drawing ‘Languages which are made to die’ alongside Burdon. 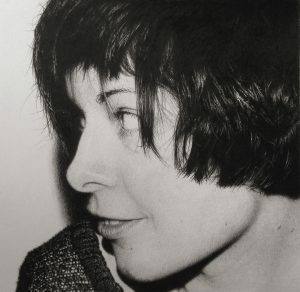 She explores, visually and in writing, the role of drawing in the creative process and its relationship to thinking. Within her selected work, flat plains of colour contrast with delicate lines rendered in pencil – it appears intuitive and fresh, as if the artist is drawing as a form of embodied thinking. 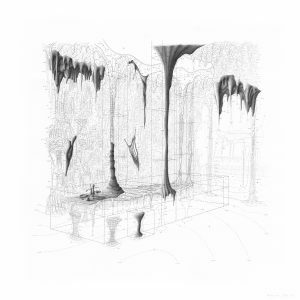 RIBA Selsa Prize-winner James Eagle, meanwhile, underlines the creative scope of architectural drawing with ‘Dining Room – CaCO3 Depositional House’. The highly complex work sits at the intersection of art, architecture and ecology, and is a culmination of Eagle’s rich research areas – biological architectural systems and surrealism. The Derwent Art Prize continues to showcase drawing in all its diversity and a visit to Cumbria’s Pencil Museum is guaranteed to inform, inspire and expand visitor’s understanding of the drawing techniques and mediums utilised by creatives across the world today. The exhibition is open to the public until the 31st January 2019. Previous Post:Christmas is just around the corner – here’s our suggestions for the festive season!